Manager John Farrell gets the ball from Red Sox starter Clay Buchholz in the third inning. General manager Ben Cherington paced back and forth in the small space that serves as the office of Red Sox manager John Farrell on Tuesday night, head down and hands buried in his pants pockets. Farrell sat at his desk, half his uniform still on. Mike Hazen and Brian O’Halloran, two of Cherington’s top assistants, sat silently on opposite ends of a couch. As the decision-makers spoke in low tones, the players hurried out of the clubhouse, eager to be most anywhere else after a dispiriting 11-8 loss against the Toronto Blue Jays. It was a scene reminiscent of last season, when the Sox finished in last place. Cherington eventually stopped trying to figure what went wrong and traded seven players in July after releasing two others. The Sox can’t give up this time, not with the highest payroll in team history. Their problems are ones that have to be fixed, not forgotten. “It’s just a tough patch right now and we’ll get through it. We’ve got to find a way,” second baseman Dustin Pedroia said. The Sox scored four runs in the second inning, then watched Clay Buchholz give the lead away in the third inning. The Sox kept scoring but their worn-out bullpen allowed six runs. After getting the lead, Buchholz walked the first batter he faced. That opened the door to a bigger inning by Toronto. “Whenever the team gives you a four-run lead, it’s supposed to come out a lot better than that,” Buchholz said. Buchholz (1-3) allowed five runs, four earned, over 2⅔ innings. 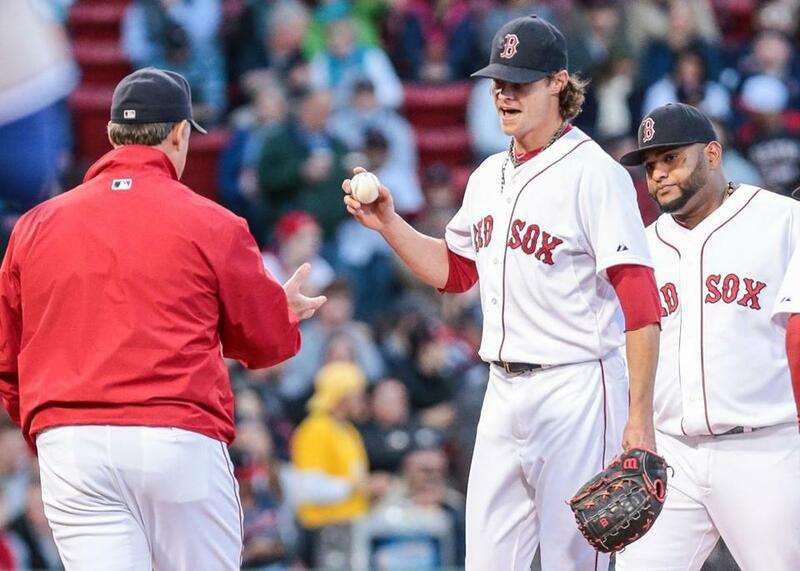 The team’s Opening Day starter, Buchholz has a 5.76 earned run average. That two other starters have higher ERA speaks to how bad the rotation has been. As a group, the starters have a 6.03 ERA. “So many times the starter sets the tone,” Farrell said. 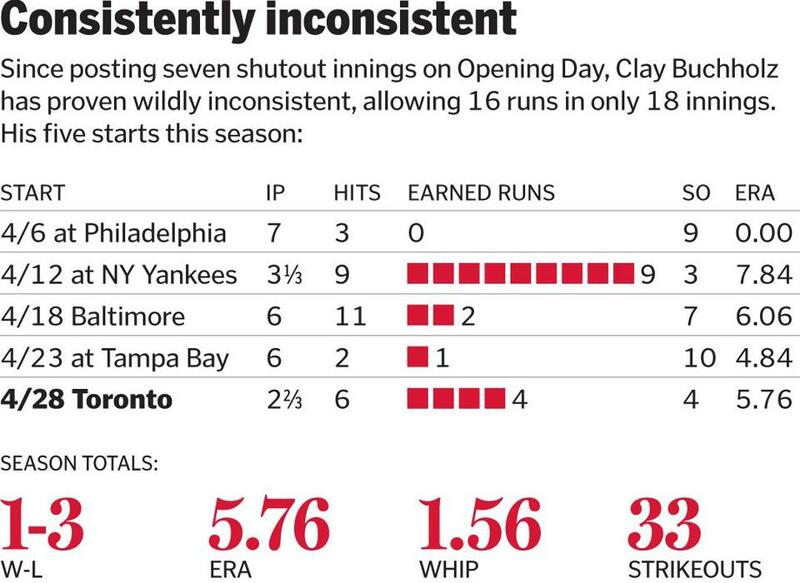 Tuesday night was the fifth time in 21 games a Red Sox starter was unable to complete five innings and the eighth time a starter allowed five or more runs. The Red Sox have allowed 34 runs on 43 hits in the last three games. The Sox are a study in extremes. They are second in the American League with 109 runs scored and last with 118 allowed. That they are 11-10 and only two games out of first place suggests there’s no reason to panic. But clearly something has to change. “It’s 21 games, but it’s a small sample compared to the big picture. We’ve got to get back to the process in every phase and go from there,” Pedroia said. The Red Sox took a 4-0 lead in the second inning against Toronto starter Drew Hutchison. With two outs and Pablo Sandoval at third base, Xander Bogaerts singled, scoring Sandoval. After Ryan Hanigan walked, singles by Mookie Betts, Pedroia, and David Ortiz each drove in runs. Pablo Sandoval went 4-for-5 and scored twice Tuesday. But Buchholz, who pitched well in the first two innings, crumbled in the face of prosperity. He walked Kevin Pillar on five pitches. Ryan Goins followed with a single off the wall in left and Devon Travis with an RBI single to right field. Josh Donaldson singled to drive in Goins. Jose Bautista’s sac fly to right scored Travis. When Edwin Encarnacion singled to left field, Donaldson scored. 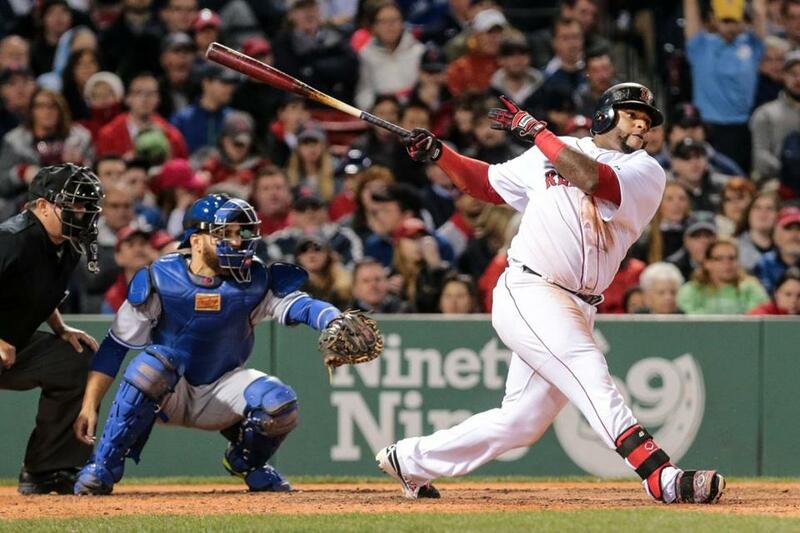 Hanley Ramirez failed to pick the ball up cleanly and Encarnacion took second on the error. He scored when Michael Sanders singled. Buchholz was taken out of the game at that point and booed by the crowd of 33,920. It got worse. Edward Mujica allowed three runs on three hits, two walks, and two balks in the fourth in ning. He could be designated for assignment given his uneven performances over two seasons. Mujica was one of the first players to leave the clubhouse. He passed a sign that said “accountability” on his way out. Anthony Varvaro was next out of the bullpen. He allowed one run over 1⅓ innings, a sterling effort compared with those who preceded him. The Red Sox scored a run in the fourth inning when Betts doubled and came in on Ortiz’s sacrifice fly. Ramirez singled with two outs then was thrown out stealing second, a reckless play with his team down three runs. Hutchison loaded the bases in the fifth inning and was taken out. Marco Estrada got two outs before Betts worked a walk to force in a run. Pedroia had a chance to get the Sox back in the game but grounded to shortstop. Toronto added to its lead in the eighth inning when Bautista homered to left field against Craig Breslow. Ramirez hit a two-run homer in the eighth inning but the Sox did not get closer. As Sandoval tried to be optimistic, the meeting continued in Farrell’s office.